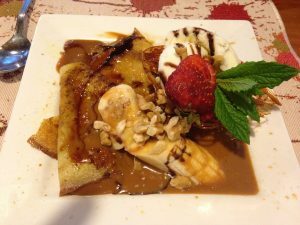 In the evening, we went into town to shop and have dinner. Sunday morning, a bus came to pick us up to take us to Perito Moreno, one of the world’s largest glaciers. 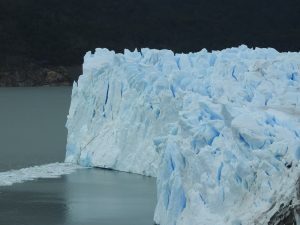 The glacier is attached to Lake Argentina. 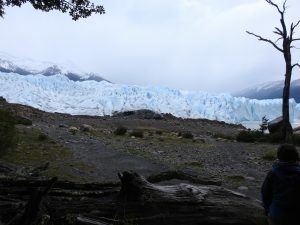 When we got there, we had about an hour to walk around the observation area, a series of wooden steps and ramps that gave us views of the glacier from different angles. 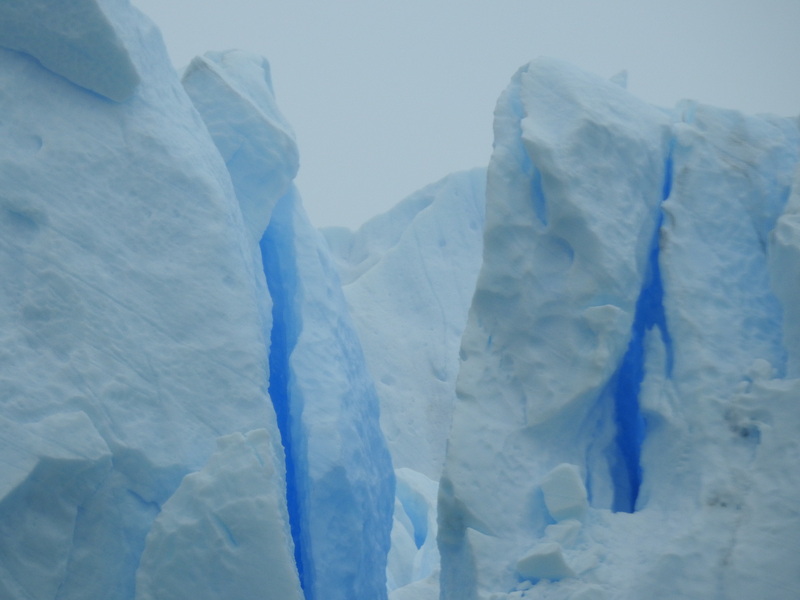 With white ice everywhere, the deep blue color of the ice in the crevices draws your attention. From there, we hiked to the lake to catch a boat for a 20-minute ride to a lodge, where we set down our packs and took only what we needed on the hike. For me, that consisted of my camera. It was cold and a light rain was falling, so I wore my third layer shell jacket for only the second time on this trip. 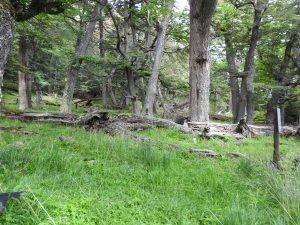 The short hike took us across a beach and through a forest. 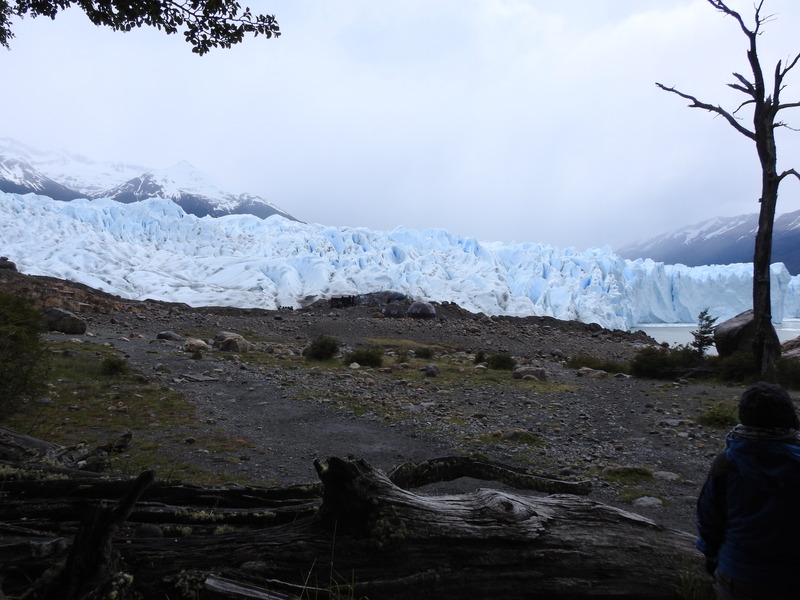 We were told that there are only two places on earth where glacier and forest cooexisted next to each other: here and in New Zealand. In the distance, we saw a couple of domes and buildings. This is where would be we donning our crampons. 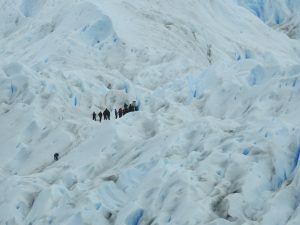 We could also see a few groups ahead of us that were beginning their climb. Prior to that, in my head I had pictured us walking off of an observation ramp onto the top. 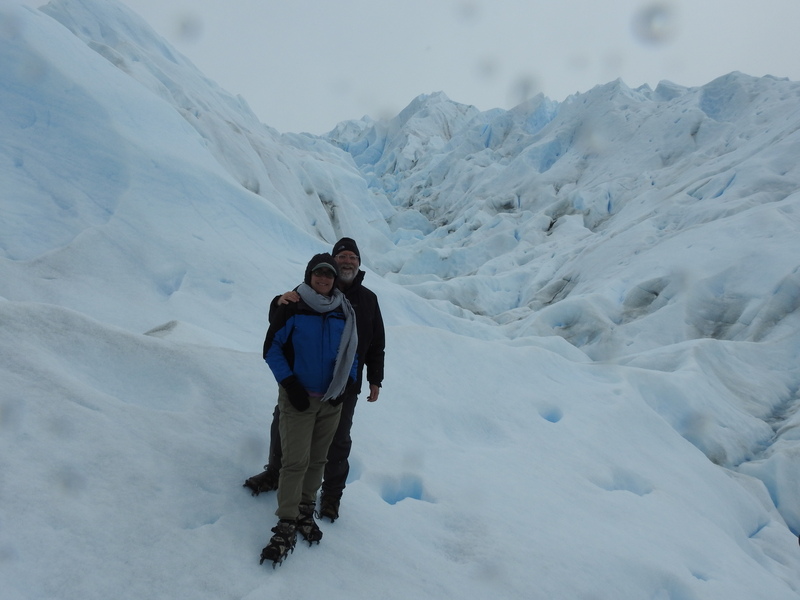 Walking *on* the glacier. When we saw the groups ahead of us, we realized that we were actually going to climb the thing. Our guides put the crampons on over our hiking boots and gave us a little more instruction on how to climb up and descend down; short steps, solid contact with the ice, and proper foot position. And then . . . we were off. 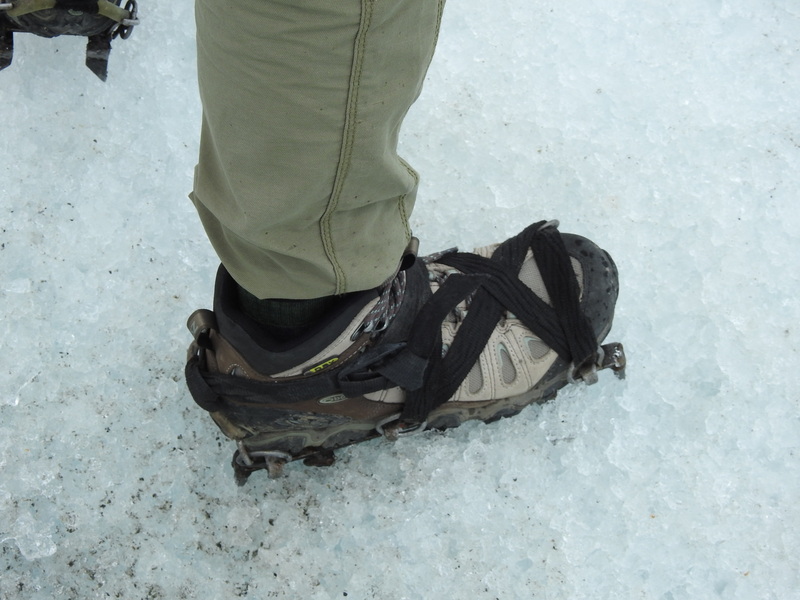 It was really weird at first, walking with crampons. Basically, they’re like skates that attach to your shoes, except instead of wheels or a blade you have these long spikes. Your shoes definitely felt heavier, and there was a little resistance when lifting your foot. They gripped the ice really well, though. Facing a steep incline in the ice, my brain was telling me that this wasn’t a good idea, but the crampons did their job, and it wasn’t that hard getting the hang of it. We would walk for a few minutes along the path our guides set for us and then stop for a breather and pictures. The ice was drinkable; it was like being in the Wonka factory. To either side, there were steep valleys and crevices, so you really had to stay in the narrow path and watch where the person immediately in front of you was stepping. The guides had a difficult job keeping us cattle away from the deeper crevices. 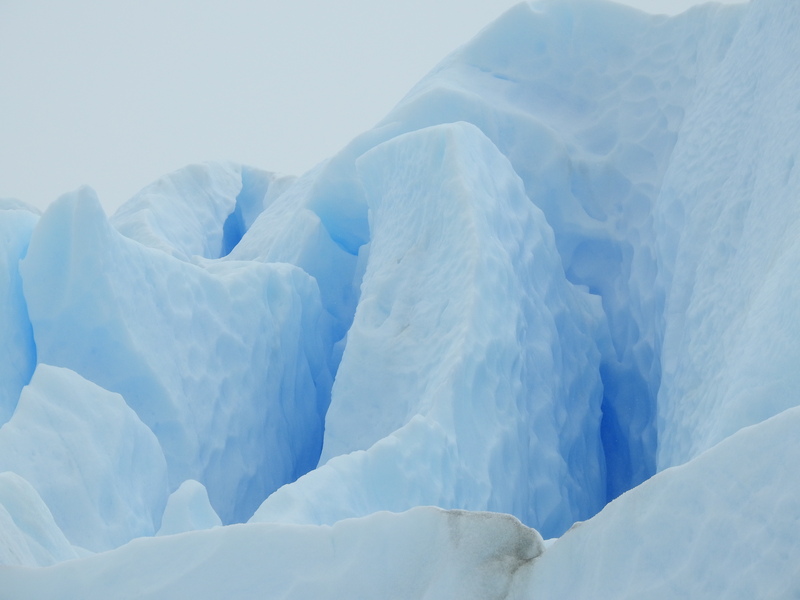 All you heard was that satisfying crunching sound of walking on ice and snow. In a few places, there were little rivers running. 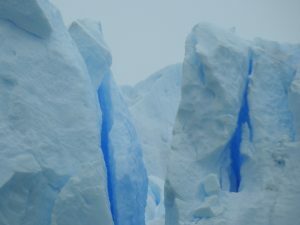 We also saw holes in the ice that you needed to avoid. Occasionally, the guides would take their axes and carve out steps for us. 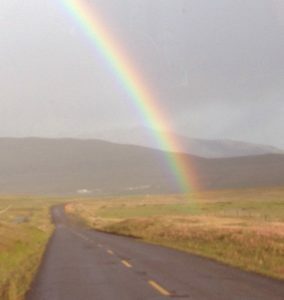 I have no idea how they navigated and knew where to go. 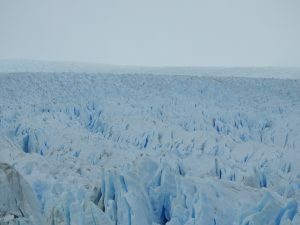 It was like being in a giant ice labyrinth. 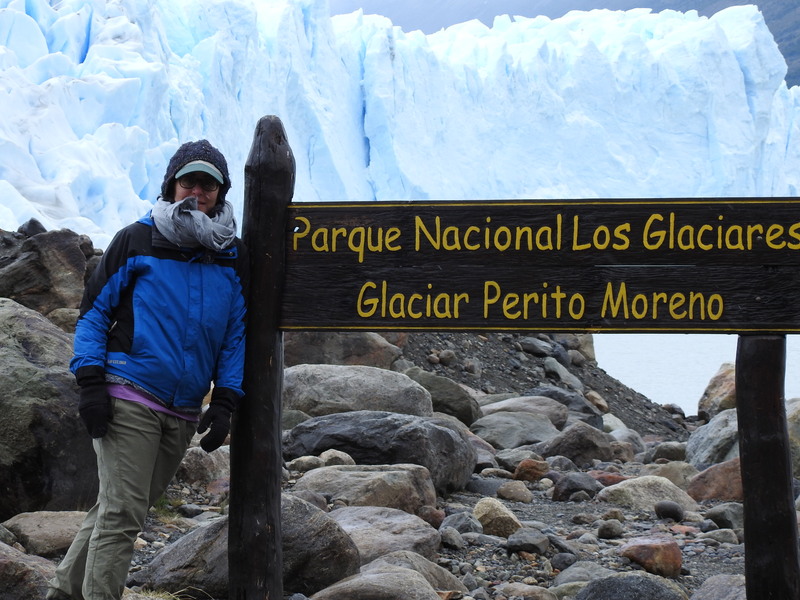 We got about halfway up the glacier before we started heading down via a different route. 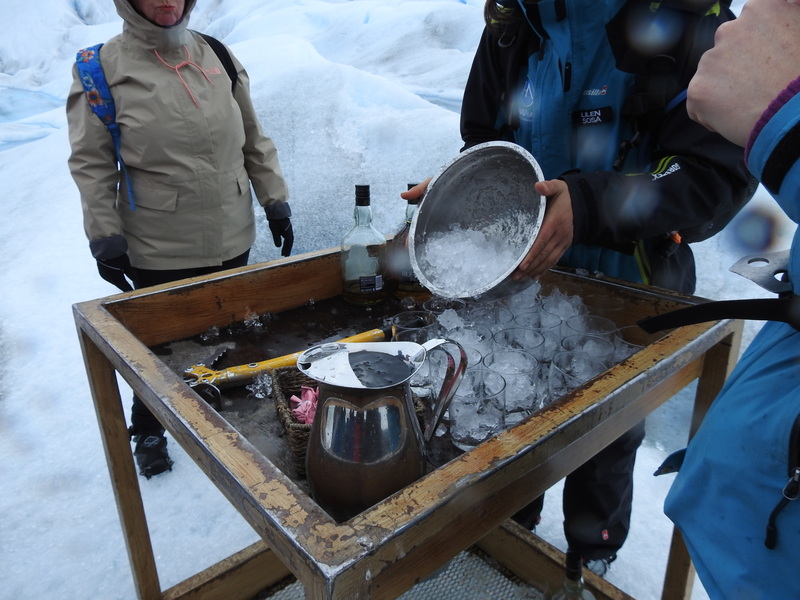 We made a stop at a makeshift bar, where one of the guides carved some ice for us while the other poured whiskey. After a group toast, we continued our descent. The experience was surreal. It wasn’t easy, but it wasn’t hard either. It was just . . . a bizarre thing to do, unlike anything we’ve done before. 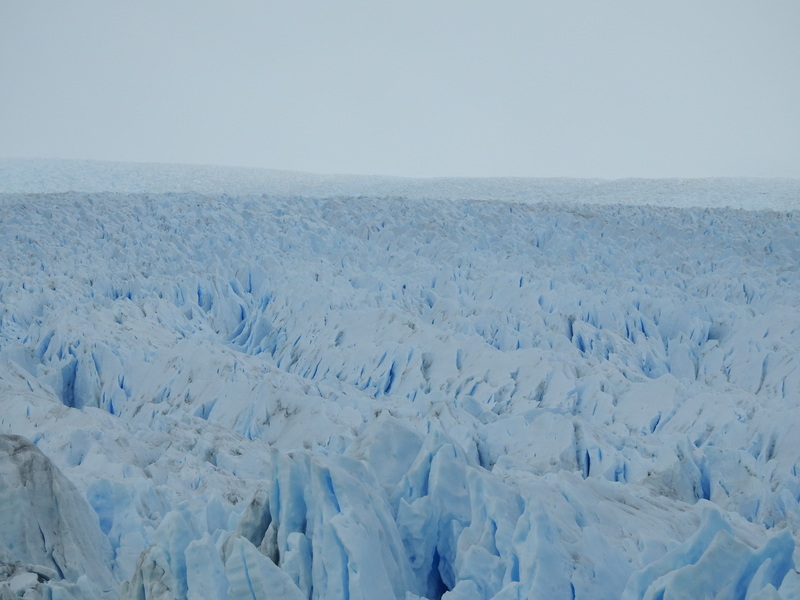 Back on the ground, we looked at the glacier differently than we had before the climb. As in: yeah, we actually climbed that sh*t! And now . . . packing for the trip home. We have an afternoon flight to Buenos Aires, a cab ride to the other airport, and a redeye to Atlanta. We haven’t taken a trip like this in many, many years. We had such high expectations and have been excited about it for months. And it more than lived up to anything we imagined. For those who are still reading this, thank you for sharing it with us!